The Palestinian Campaign for the Academic and Cultural Boycott of Israel calls on the Irish Football Association to cancel its “friendly” match between Northern Ireland and Israel set for September 11, 2018. Israel uses international sporting events to prop up its failing image as it becomes increasingly isolated due to its flagrant contempt for Palestinian rights. 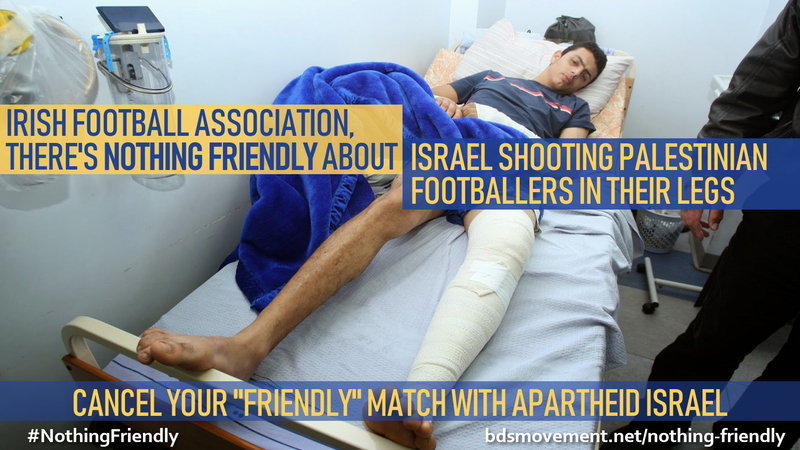 On March 30, 2018, Israeli snipers shot footballer Muhammad Khalil Obeid in both knees. He and tens of thousands of Palestinian in Gaza were peacefully protesting against Israel’s denial of their UN-sanctioned right to return to their homes and its ever tightening siege on Gaza. This very siege prevents Palestinian athletes from getting essential treatment for their injuries, resulting in amputations and lifelong disabilities. In 100 days, Israel has killed more than 130 Palestinians protesters in Gaza, and injured over 14,000, many disabled for life. Gaza has an newly formed football team made up entirely of amputees. 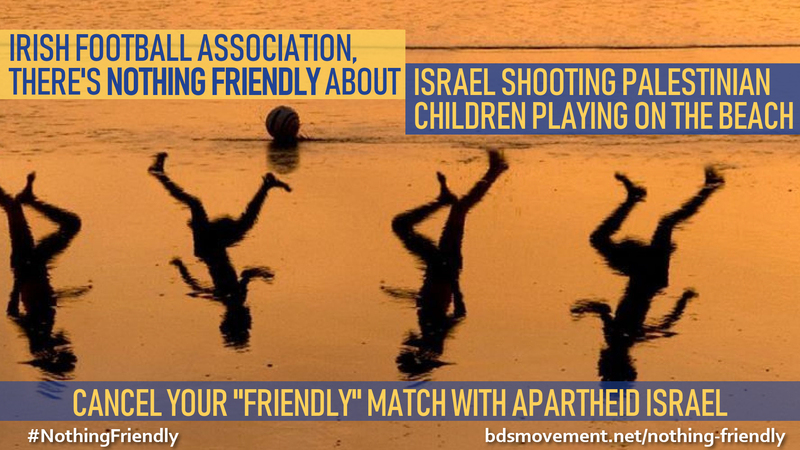 Nearly 90% of its players lost limbs due to Israel’s violent military attacks on the civilian population. The Israel Football Association includes six teams based in illegal settlements that rob Palestinians of resources and push Palestinian families off their land. Israel demolishes Palestinian homes and entire communities to make way for these racially exclusive settlements on stolen land. Palestinian families are separated from their land and each other by Israel’s apartheid wall. Military checkpoints and denied travel permits prevent Palestinians from freely traveling to, from and within our homeland, including athletes traveling for championship matches. Israeli soldiers abduct Palestinian children during terrifying night raids. Israel is currently holding nearly 300 Palestinian children in prison where torture has been amply documented. This is just a small sampling of Israel’s 70 year-long violent oppression against Palestinians. This is what Israel hopes to keep on the sidelines. 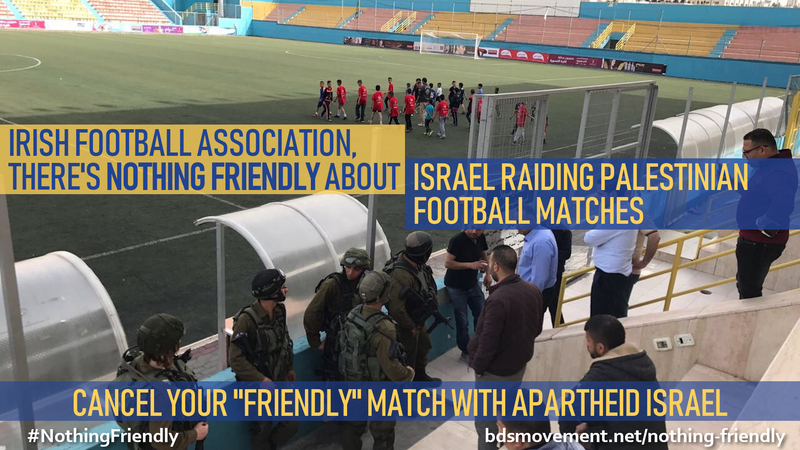 Holding a friendly match with Israel sends the message that Israel’s indiscriminate slaughter of Palestinians is acceptable; that systematically ending the dreams of promising young Palestinians footballers is not significant. Even worse, it gives Israel a green light to continue its crimes, with impunity. Palestinian civil society has called for no business as usual with Israel as long as it denies Palestinians human rights. The Irish Football Association has the power to cancel this friendly match, unlike official matches under FIFA, and to stand on the right side of history. Last month, Argentina’s national team canceled a friendly match with Israel. Striker Gonzalo “El Pipa” Higuaín said “the right thing was not to go to Israel.” More than half a delegation of NFL players withdrew from an Israeli government-sponsored trip in 2017. Sports boycotts played a significant role in challenging South African apartheid. A growing number of sports figures are recognizing Israel’s use of athletic competitions to sports-wash its attacks on Palestinians, and are refusing to be a part of it. 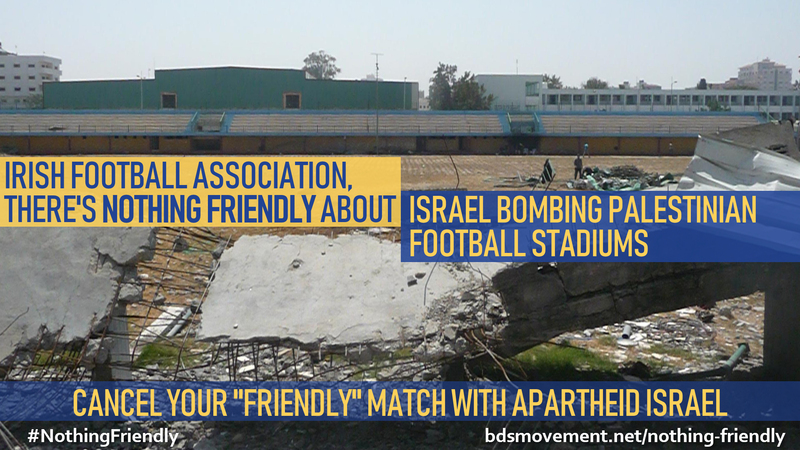 We urge the Irish Football Association to take a stand for justice and cancel its friendly match with Israel. 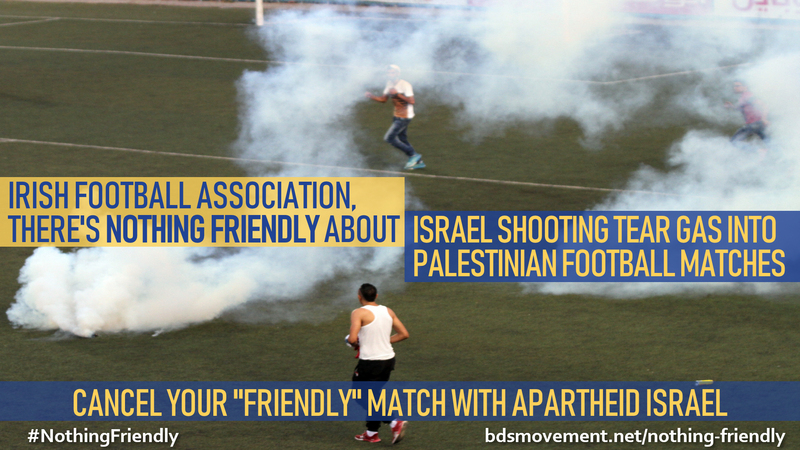 There is nothing friendly about Israel’s oppression of Palestinians. 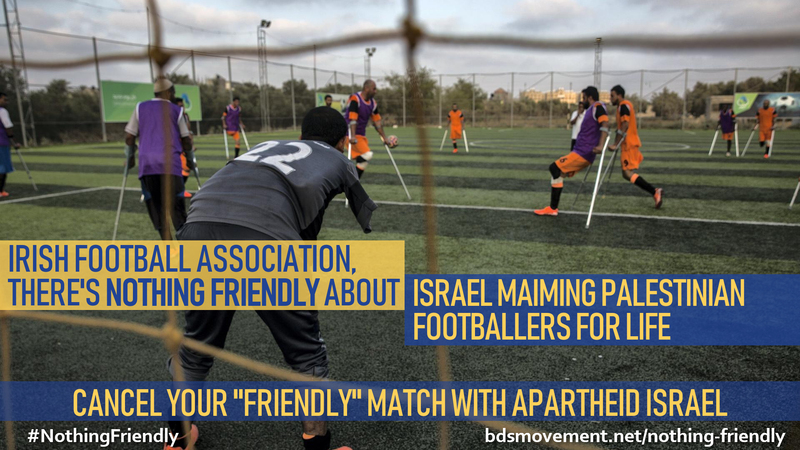 Until Palestinians can live can live with freedom, justice and equality, there is no place for “friendlies” with Israeli apartheid.